Have you ever wanted to be a boat? World of Warships launches today with 10 maps, four classes, dozens of ships but not a single pirate. This critical oversight is only exaggerated by the hectic cinematic launch trailer, which shows battleships dueling across islands with huge cannons. In-game your experience will differ significantly based on the fleet role you choose. Large ships carry serious artillery pieces that can nuke boats from afar. Aircraft carrier players play the game almost as an RTS, organising and commanding individual fighter/bomber squadrons. 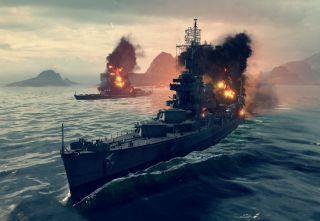 Like Wargaming's World of Tanks, Warships is free to play, but you'll need to buy some in-game gold eventually to upgrade your ships at a sensible rate. If you want to try it you can sign up on the World of Warships site. It will be interesting to see if Warships develops to reflect upcoming warship technology. Rail guns are due to be test-fired from some US ships next year. They use electromagnets to fling slugs at some 5,000 miles per hour. Laser weapons are in development. Supreme Commander is surely only a few steps away.